Despite its relatively small size, the clock tower is one of the most significant buildings on the “Piazza San Marco” square in Venice. The building is clearly visible from the water, from sailing on the Grand Canal ships. It was evidence of the wealth of Venice. The central part of the tower was built between the 1496 and 1499 years by the architect Mauro Codussi (two side wings of the building were built later). 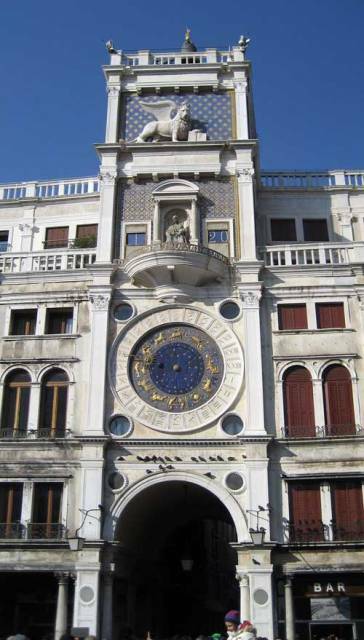 Until now the building immediately attracts the attention of tourists on San Marco square. There are a bell and two bronze sculptures on either side of the bell which strike the hours on a bell at the top of the tower. Sculptures are known as the “Moors” (because of their dark color). It is believed that the sculptures depict the shepherds. One of them is old, the other is young. Below this level is a picture, symbol of Venice, the winged lion with an open book on a blue background with gold stars. Initially, in front the image of a lion, there was also a statue of the Doge Agostino Barbarigo. Below is the sculpture “Virgin and Child”. On either sculpture sides are two large blue bar showing the time: the clock on the left panel (the Roman numerals) and minutes on the right panel (Arabic numerals). Twice a year, on Epiphany (January 6) and Ascension (Thursday 40 days after Easter), wooden sculptures of three wise men and an angel with a trumpet go out of one of the doorways, bow Virgin and child, and go back through another door. Below is a large dial in the blue and gold colors. Roman numerals indicate the hours. Golden clock hand (pointer) with the image of the sun shows the time. There are also moving images of the zodiac signs on the dial. The clock hand indicates in which sign of the zodiac the sun is located. The clock also shows the phase of the moon. The tower was built between the years 1496 and 1497 on the north side of the Piazza San Marco square in Venice. The tower and clock grand opening ceremony was held on 1 February 1499. The tower and the clock many times restored and repaired. A museum is located on the tower now. Clock Tower photo was taken during a tourist trip in Italy in February 2013. At the top of the tower is visible fragment of the bell. Sculptures “Moors” are on the left and right of the bell.